Vandana, Afreen and Tara are three young girls bound together by a bond stronger than blood. Vandana and Afreen, the older two quit school and work at a tea stall so that Tara, the youngest can continue studies. After a tiring day working at the tea stall, it is a smelly cow shed on Monkey Hill that gives them refuge at night. One night, after a busy day of work, the three girls relax on Monkey Hill with its nearby waterfall, where they can forget the smells of kerosene and too-sweet-chai and enjoy the fresh air. Afreen, the dreamer, starts to tell a story. A little later, Vandana, the oldest, wary about the growing darkness tries to get them to head back. But she gives in to the pleas of Afreen and Tara and they stay to hear Afreen complete her story. All of a sudden, the girls are jolted by Miss, their dog’s barking. A sudden movement in the bushes holds them back for the hill was still wild. It was only Afreen who managed to see what Miss saw and got startled by – a little man, small in height but fully grown. On hearing this, Vandana decides that Afreen is making it up, and when the rains start to pour all of a sudden, she herds the girls back to shelter, refusing to listen to Afreen and Tara’s cries to explore. Tara, however is quite displeased at not being given a chance to find out. Back at the cowshed, she stubbornly lays awake until the day’s exhaustion draws her to sleep. The next morning, Tara awakens with a start to find that she has woken first. Taking Miss with her, she quietly heads for the previous night’s spot. No sooner does she reach the spot that she finds herself face to face with the little man. Ambushed all of a sudden by a stranger and a barking dog, the little man turns and scoots off downhill, alongside the waterfall, with Miss chasing him, barking excitedly. Coming back to her senses, Tara runs after Miss, but when she catches up, the little man is nowhere. That is when she becomes aware of where they were – under the waterfall; a rock jutting out from above threw the waterfall away from the slope. There beyond the grassy patch, just behind the waterfall, seemed what appeared to be a tunnel! Footprints and hollowed out clumps of wet mud convinced Tara that the little man had gone down the tunnel. After debating whether she should turn and go back before Vandana and Afreen woke up, or pursue the little man and discover where he had disappeared to, Tara gathers her courage, goes towards the tunnel and slides down. Little does she know that this act of courage would change their lives forever. The tunnel takes Tara, Miss, and later Vandana and Afreen to Rasphora, a magnificent land behind the waterfall. But Rasphora is in grave danger – so says the prophecy of the land, and protect it, the Rasphorans will be unable to – except for four Hill People … But they are only three; besides how are these children to save a land they’ve just stumbled upon? 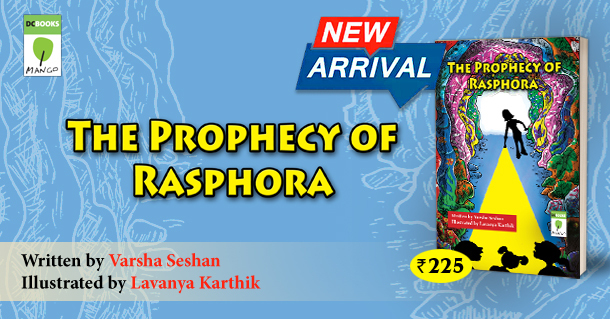 Read The Prophecy of Rasphora to find out.